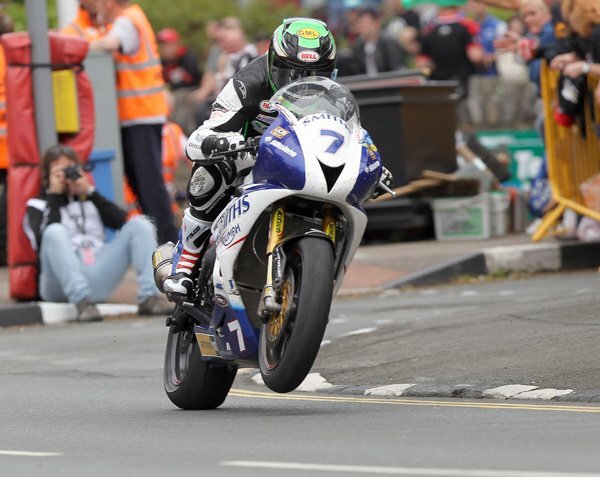 Gary Johnson, who won the 2014 Supersport title at the Isle of Man TT, will sensationally be replaced in the Smiths Triumph set-up at this year's June showpiece by network Television star and part-time truck mechanic Guy Martin - who is still without a win at the iconic Manx event. Despite handing the British team and manufacturer a coveted TT win last June, and offering to ride for free in 2015, Johnson was told there was no place for him in the Smiths set-up this year on the roads. "I'm as shocked as anyone at the decision after giving Smiths and Triumph a win on their debut at the TT last year," said the hard charging Lincolnshire man, who isn't completely in the wilderness, having secured a deal to ride in the 1000cc classes this year on the roads for the factory-backed GB Moto Kawasaki team. But he is a little exasperated at the late decision. "I suppose the lure of Guy and the TV exposure he brings was too hard for them to turn down. All I can do now is go and find a top-class team," he lamented. "I have proven that I can win TT, something Guy has still to do. I would love to have been given the chance to ride alongside Guy in the same team, as I'd have mentally destroyed him before we even got to the race-track," said Johnson assertively. Martin will ride for Tyco BMW on the roads this year in the 1000cc classes, but with the German manufacturer not able to provide a middleweight machine, he has jumped on what is potentially the best Supersport bike for the job between the hedges. Martin said of the deal: "I wanted the best tool for the job in the Supersport class, so I rang the Smiths team and we ended up doing a deal. I reckon the Triumph is the bike to be on, and I have a few jobs with the Triumph after the TT - so I'm looking forward to getting them sorted." Martin's Tyco BMW team-mate William Dunlop will ride a Yamaha R6 for Randalstown businessman Chris Dowd at the three internationals, leaving just a question mark over what machinery, if any, Alastair Seeley will ride at this year's NW200.